As one of the leading private carriers in Indonesia, weâ€™re always on the look out for highly motivated and service oriented people who are ready to make their mark on our operations. All our people share our passion, energy, drive and commitment to exceed our customers expectations. The Lion Air promise is to put the customer and their experience of travelling with us on the forefront of everything we do. Friendly and yet always professional, ours is a unique business to work in. So long as youâ€™re prepared to have a great time delivering excellent service, weâ€™d love to hear from you. Click "Register" on top right webpage to create username and password. Confirmation and Activation Link would be sent directly to your e-mail(check your inbox/spam folder), please follow the instruction on your e-mail to be automatically redirected to the recruitment. Once you're logged in you will be redirect to Resume page for fill your online resume,Please ensure that you fill out all the required personal information.Then you will redirected to recruitment. Choose your desired position at Career List, check carefully for details. Once you're logged in you will redirected to recruitment. You can update resume or choose your desired position at Career List. In terms of socialization and recruitment process. 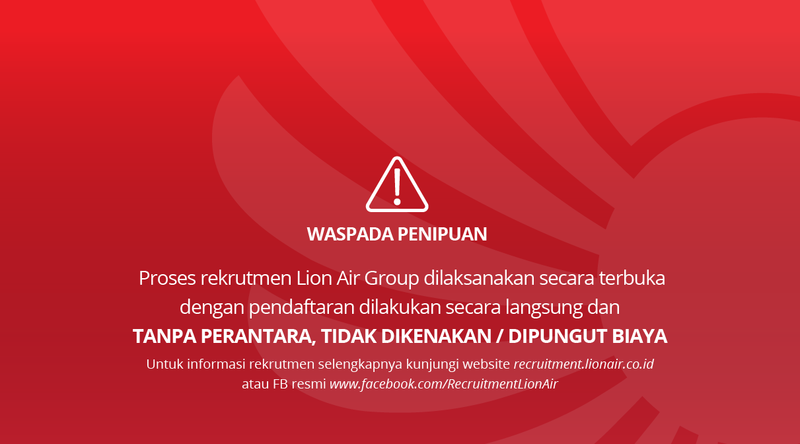 Lion Air doesn't cooporate with any party and the whole recruitment processes are free of charge. The final desicion of acceptance will be fully authorized of Lion Air. Q : Can you look at my profile/hire me ? Lion Air provides a great careers site at Lion Air so that you can search out and apply for roles that are appropriate to your background. Q : How long should the hiring process take? There are no set time frames for the hiring process within Lion Air, but the recruiting team do work to make every process as quick as possible. Q : Are there any vacancies in _____? Please review our careers site for available opportunities.